Short and sweet is a rule that many dance music producers would do well to adhere to. Sure, there are occasions when a longer, more drawn-out, slow-building vibe is called for, but all too often it's a case of too many bars and too few ideas. 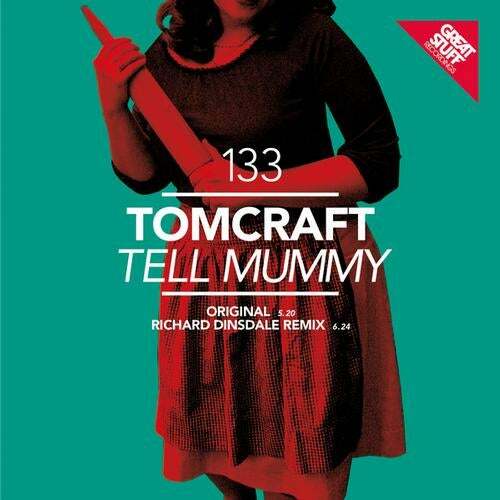 Great Stuff founder Tomcraft returns to his home label with 5 minutes and 20 seconds of razor-sharp electro tech on Tell Mummy, showing the beauty of succinctness. His original is a pounding beast, introduced with soft vinyl crackles and eerie textures and FX before a killer Moroder style arpeggiated bassline thumps into focus. Nagging tech-trance flavoured synth lines build the tension over taut, undulating over and weaving in between each other before a classic rave vocal cuts through the build-up and the full manic energy of the track is unleashed in all its glory. It's stadium-sized stuff to really kick a set into overdrive with. England's Richard Dinsdale is firing on full form once again, and proves he's worth his salt with a sumptuously rolling techy refix. Mashed-up vocal edits and rasping electro and tech synth blasts, bleeps and zips help to create a gently mind-bending atmosphere atop a bouncy, hipshaking groove that's hard to resist. So why bother trying? Stick it on and discover that sweet spot between big room energy and underground cool.